Auditions for Arc Stages winter/spring theatre workshop, teens and tweens! Note: All should be prepared to come back on Sunday, January 27th for callbacks. Tweens 1-3:30pm, Teens 3-6pm. About our process: When you sign up for an audition, you are signing up for the session! We do not make ‘cuts.’ Auditions are simply a way for us to get to know our actors each session, and for them to gain confidence and comfortability with auditioning. Instead of choosing a show in advance and shoehorning children into it, we choose our shows, and our schedule for the semester, based on the schedules and auditions/callbacks of the actors who sign up. Our emphasis is on the process of putting on a show, integrating theater games and acting exercises throughout the rehearsals. Tween actors will experience a professional rehearsal process, coupled with theatre games and acting exercises designed to fit their learning levels. The tweens will dive deeper into their work as actors as they endeavor to gain confidence and knowledge about all aspects of theatre and performance. 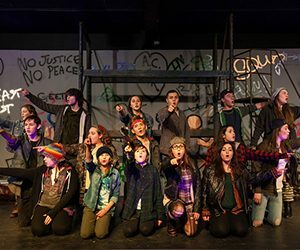 A conservatory program, the Teen Intensive will consist of professional training from actors and directors with extensive experience in the business. Rehearsals will include technique in acting, musical theatre, singing, dance, and improv. This Intensive will culminate in a full-length play or musical theatre production. **Classes for pre-k through 4th grade also available! Visit Arcstages.org for more information on all of our workshops, classes and programs.